…….. or should that be buying miniature art ? 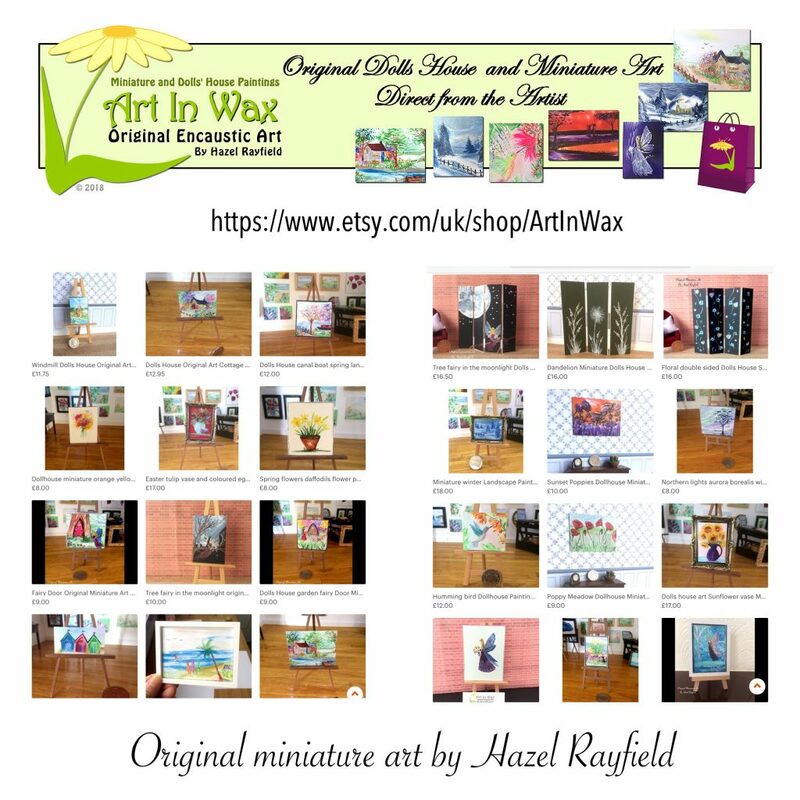 There are three main places where my miniature paintings can be viewed and purchased. These being ; this website and by direct contact via my website, via my Facebook page and via my Etsy store, which is where I have my largest stock holding and where most of my International sales initiate from, my art is now in sixteen countries on four continents as far as I know !! Yes I have to pinch myself sometimes !! Whichever of these places you order your miniature art from you are buying direct from me the artist and therefore know the provenance of your original art. Everyone of my miniature art paintings is unique, some may be similar but no two are identical. Each is an original unique piece of miniature art. As you can see I love colour. The encaustic paint has such a vibrant depth of colour which suits me and my style of painting very well. My passion for painting in miniature has lend me paint many subjects, some more than others, my fairy paintings are very popular as are my landscapes and flowers. Floral bouquets and flowers which I do love to paint, pretty landscapes with cottages, windmills and occasionally a vintage caravan or river maybe. I also love to paint seascapes, beach huts, sailing boats and the odd galleon !! 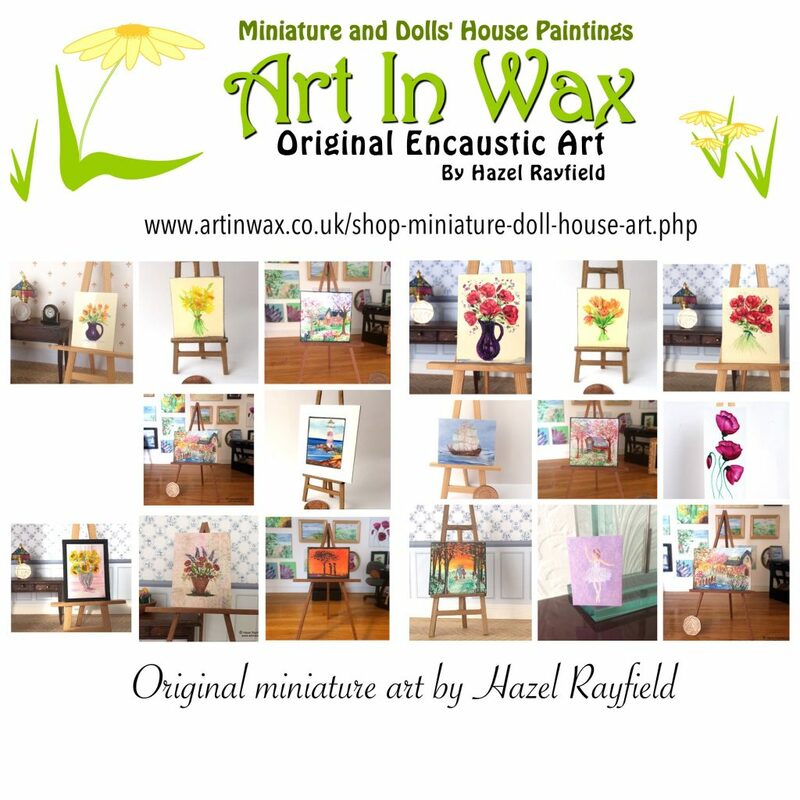 If you buy a listed piece from my dollhouse shop page on this website and you in the UK then postage is free. I’m happy mail overseas from Art In Wax but the postage needs to be added. My Facebook page and the Facebook miniature community is where I often show my newest and latest paintings and sometimes my work in progress. This is resulted in many sales from this and often paintings are bought before they reach either my website shop or my Etsy store. I accept PayPal payments here on Art In Wax or if you contact me directly via Facebook. This is how my miniature art store on the international shopping outlet Etsy looks this morning. Well the front page sections. I ship worldwide and on Etsy they sort out all the currencies conversions and offer different methods of payment, PayPal is used and paying via direct card payments. As you can see from this ”snap shot” the listings are very varied …… I paint to suit many types of dolls house and miniature property. My paintings suit an array of room styles from bedrooms, nursery’s to lounge, dining rooms, I’m told they are in grand hotels, mansion houses, boutiques, shops, tea rooms, cafes and much much more …… plus some unique themed room boxes and diorama settings. There are several posts on my blog showing some of the pieces in their homes. Also my screens, which are miniature room dividers are an original art as unique miniature furniture. People ask me what are my favourite to paint, that’s a really hard question. I love painting, its my passion and yes I have had favourite pieces but often my favourite depends on my mood and the challenge I’m working on. Pretty landscapes, the challenge of the windmills and cottages, bouquet of flowers, poppies of course, roses and sunflowers too, spring flowers, a touch of fantasy with fairies and fairy door paintings, seascapes and surfer beaches, vintage caravan or retro cars, cupcakes and Easter chicks all these dollhouse and collectible miniature ACEO art cards have a place in my favourites……..
Why not leave a comment below.